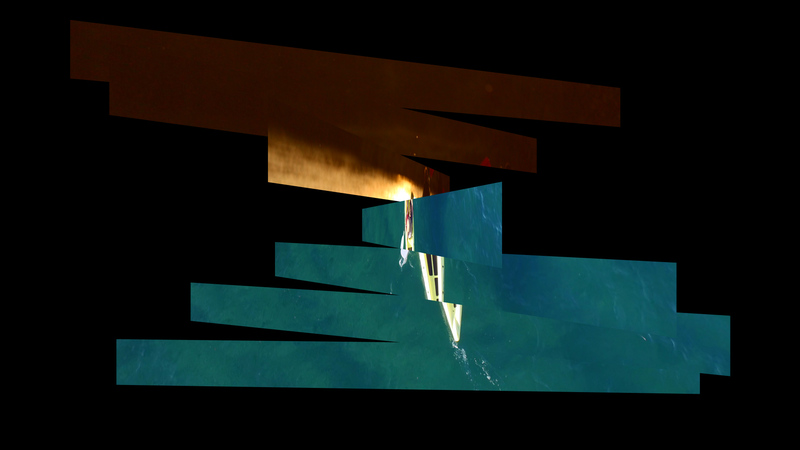 A 3D Transition that divides the layer into sections which rotate in an offset fashion vertically or horizontally revealing the 2nd layer of footage. The Animation drop-down menu gives multiple choices of interpolation styles for the animation of your transition. The default is 'Ease In Out Quad'. The Tiles control allows you to set how many sections the transitioning Layers are broken up into. Note: the more sections, the longer the render time might be. The Dolly slider gives you control to move the camera closer in or further away along the Z-axis from the transitioning layers. Bringing the control down to 0 will move the layer directly to the camera while turning the slider up to 1.2 will move the camera further away from the layer. The Direction drop-down menu can be used to change which direction the Tiles of the animation are moving: Right, Left, Upwards, Downwards. Add realistic motion blur by choosing a setting from the drop-down menu: Off, Low, Medium, or High. The higher the Motion Blur setting, the more instances of the layer will appear in between frames. The Motion Blur Shutter angle default is set to 180º. Turning it up towards 360º will spread the motion blur iterations out even with high number of blur levels. The Edge Smooth drop-down menu will provide levels of anti-aliasing to your edges, giving them a less jagged look. Options for the strength of the smoothing are none, low, medium, or high. Setting this to high may increase playback and render time. Lights: add lighting to your transitions. Turn on the Lights from the drop-down by selecting Local or Global. Ambient activates the Ambient color picker and affects the overall composition. Spotlight gives you the most control, activating the Light Direction X, Y, Z sliders as well as the Light Cutoff and Light Exponent controls. Light Ambient, Light Diffuse, Light Specular color pickers allow you to control the color tones that appear within the light. Camera: Allows you to enable the Local camera, then Zoom, Rotate and Translate its position in 3D space. The Camera Ortho checkbox allows you to see the transition in an Orthographically projected view that has no depth which means you can view the layer with more accuracy without the distortion of parallax.